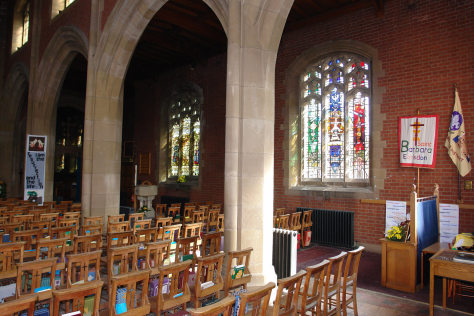 The design is arranged across the three main lancet windows, and continues above into the tracery panels. 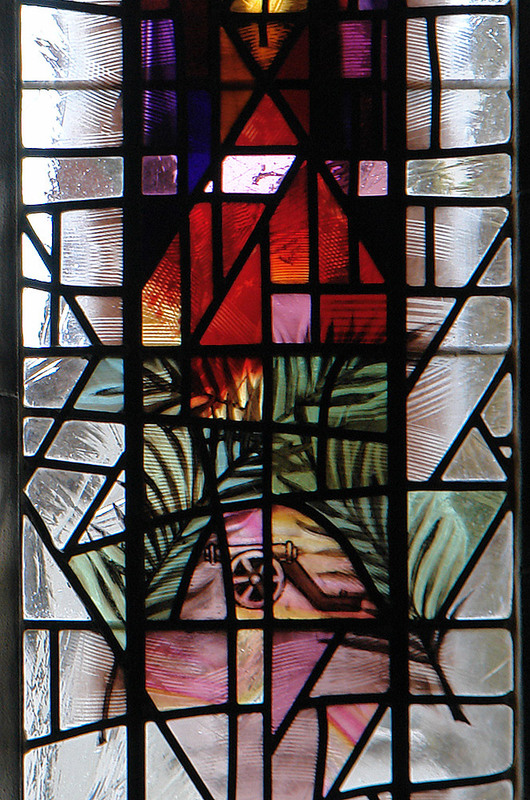 Each lancet contains a separate group of images, which are related specifically to each other, and to the window as a whole. The left hand lancet uses a palette of rich and pale greens on a background of clear antique glass to convey a sense of calm and tranquillity associated with its spiritual setting. St. Barbara’s Church employs the motif of a Chalice and Cross and this has been set in the upper section of the lancet. 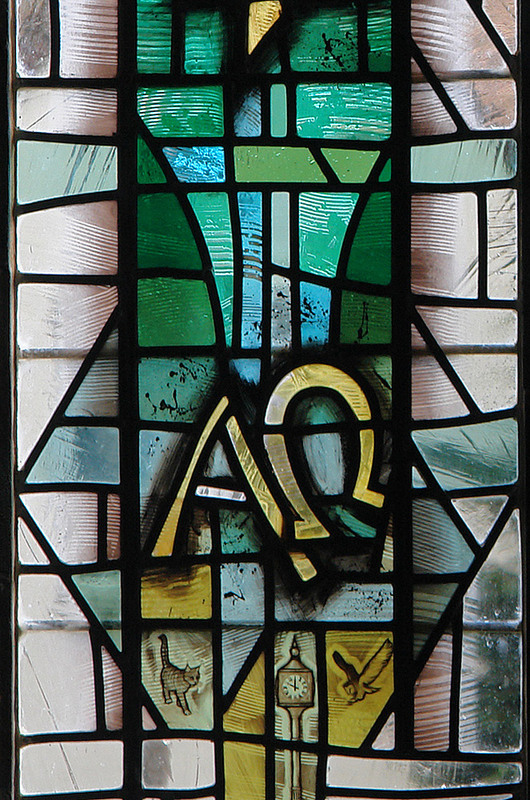 Below this are the symbols of Alpha and Omega, the beginning and the end, representing the eternal nature of Christ, and in this window referring to the beginning of Christ’s ministry in the temple with the elders. Below this, the rich greens fade through pale tints to clear glass. The central lancet uses a palette of rich and pale blues, with the focus of the design in warm yellows and ambers. The uppers section of the lancet contains an image of the Holy Spirit in the form of a Dove, set on a background of stars in an azure sky. Below the Dove is the ancient symbol Chi Rho. Of the several sacred monograms of Christ, the Chi Rho is one of the most ancient. It is generally formed of the Greek letters chi (X) and rho (P). These are the first letters of the Greek word “XPICTOC” (pronounced Christos), which means “Christ.” The monogram has been styled in a variety of imaginative ways over the centuries. Other symbols are sometimes added to the monogram to call to mind a particular attribute of our Lord. Below the Chi Rho is the central area devoted to the portrayal of the Young Christ in the Temple. The scene is set under the encroaching cover of darkness, stars are appearing overhead, the interior is bathed in the light of the nine candles of the Jewish “Hanukkah menorah” with the young Christ in front of the scriptures. 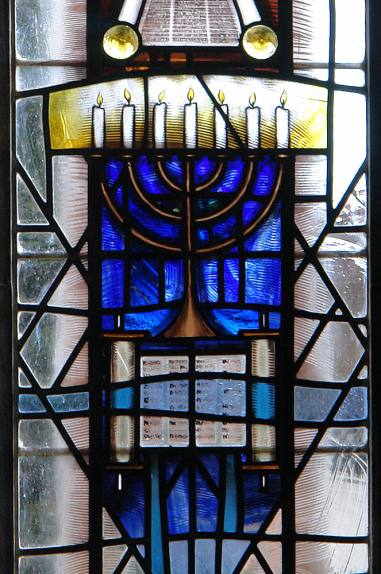 The Chanukkiyah or Hanukiah, is a nine branched candelabrum lit by olive oil. Below this is the Torah. The Torah scrolls, which contain the words of God, are always beautifully “dressed” because they are the most precious item in the synagogue. The silver ornaments on the top of the rollers jingle as the scrolls are taken out and remind the congregation to listen to the words of God. Below this, the background azure blue fades through pale blue tints to clear glass. The right hand lancet is characterised by its use of a selection of deep and pale reds, synonymous with the blood of the martyrs. This lancet celebrates the life and martyrdom of St. Barbara. The legend of Saint Barbara says that she was born about 300 A.D. in Nicomedia, Bithynia in Asia Minor. Her father, Dioscurus, was the head of a wealthy aristocratic family. Her parents adored her for her beauty, intelligence and modesty. Dioscurus, who was cruel and a pagan, had her shut in a tower in order to preserve her from suitors. Before he went off on a long journey, he ordered a beautiful bathhouse to be built for her. Before she was sent away she heard about the teachings of God and Jesus. 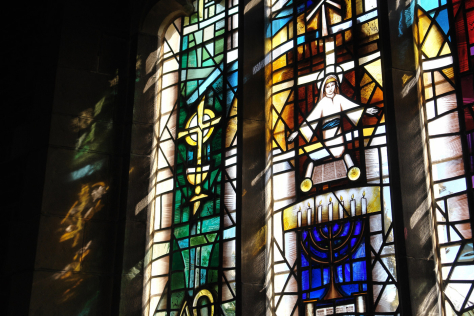 While Saint Barbara was in the tower, she found God and accepted the Christian faith. As her trust in her religion grew stronger, she asked that the bathhouse be rebuilt, this time it having three windows, representing the Holy Trinity. When her father returned, he was aghast at the new bathhouse and was furious when Barbara told him she was a Christian. He brought her before a judge who declared that she be tortured and then beheaded. Dioscorus beheaded her himself and, on the way home, was struck dead by lightning. Saint Barbara was a martyr, and is patron saint of Artillery gunners, masons, mathematicians, miners, military engineers, stonecutters, against lightning, anyone who works at risk of sudden and violent death. She is often portrayed as standing beside a tower with three windows, carrying a palm branch and a chalice; sometimes cannons are depicted by her side. 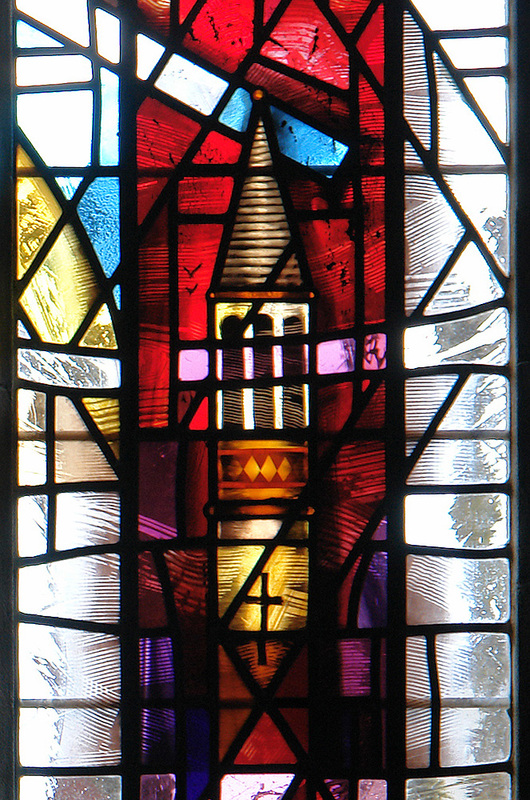 Therefore, the central section of the design contains a depiction of a tall tower with three windows. Below this are two palm fronds crossed over each other, with a cannon. Below this the background of rich reds fades through pale tints to clear glass. 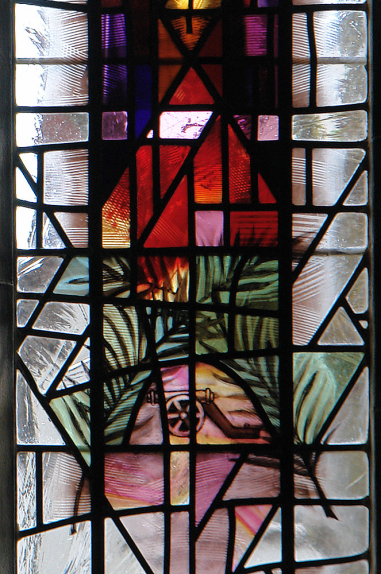 The central colour scheme to each lancet continues up into the tracery panels. The majority of painted detail will be concentrated in the central section of each lancet to create texture, light, shade and movement in the glass. All the areas within the design containing images and symbols will be hand painted and stained, using traditional materials and techniques. The panels will be leaded using traditional lead came, soldered with 40/60 blowpipe solder, and cemented with leaded light cement. The windows will be installed using lime mortar to match colour of surrounding masonry, fixed with manganese bronze supporting saddle bars.